I know, I know... you're welcome. Today, the official Borderlands Twitter dropped that there’ll be a Gameplay Reveal Event on May 1st. Borderlands 3 is the most hotly anticipated thing since sliced bread, so make sure you tune in for that. Warning! Huge spoilers for Tales from the Borderlands ahead. First up: the code in the roses. In the lower right corner of the image, running along the bottom of the poster, there’s a string of numbers. I was most excited about these, because they looked like A1Z26 ciphers, which meant that Borderlands was speaking my kind of language. I got some of the numbers wrong because I wasn’t wearing my glasses but, thanks to me being bad at maths, I figured out the code read “WE DON’T SPEAK OF SANCTUARY” anyway. I’m not sure what the 2 on the end stands for, as it’s larger than the other numbers and it would make the message translate to “WE DON’T SPEAK OF SANCTUARY B”. the numbers along the lower right hand side are basic number ciphers! "23 5 4 15 14 20 19 16 5 1 11 15 6 19 1 14 3 20 21 1 13 25 2"
"WE DON'T SPEAK OF SANCTUARY"
(am I right) (tell me I'm right) ? Is it “We don’t speak of Sanctuary 2”? Or “We don’t speak of Sanctuary B”? I have no idea. I’m just here to translate numbers to letters and talk about how much I hate Rhys’ moustache. Edit number one: I’ve been informed by a reliable source (read: someone in our group chat who actually knows Borderlands lore) that Sanctuary 2 is ‘real obscure Borderlands lore’. Sanctuary 2 is the city, which was built on top of Sanctuary 1, a Dahl mining ship. This could explain why nobody speaks of it. Secondly: the morse code either side of the poster. This one’s pretty much all in the title. On both the left and right side of the posters, there’s strings of morse code. One of the people in our group chat (who’s also an author for MSPoweruser) ran it through a translator and worked out that the left one reads “WHERE IS THE FIRST VAULT HUNTER” while the right one reads “GHO IS THE UESTROQL?”. We let him have another crack at the second one, because we’re nice people, and he came up with “WHO IS THE DESTROYER?”, which seems like a much more plausible phrase. Well, where is the first Vault Hunter? Who is the Destroyer?! These are questions that, presumably, have yet to be answered. My money’s on Vaughn being the Destroyer. That dude’s abs could shred anything. Third: the shift key on the guns. In the middle of the game poster is a Psycho surrounded by an angelic glow of golden guns. Each gun has a series of numbers and/or letters on it. Turns out that they spell 5B3BJ-XZWFW-T3KRZ-JBJTB-6WS93, which looks a lot like a redeemable shift key. We’re not sure what the key is for, exactly, although we’ve heard a rumour it’s for an exclusive Maya skin, but we’re sure one of you can find that out for yourself. Just go redeem it and let us know if we messed up. Edit number two: Reddit user u/CptQ informed me that yes, it IS a shift key! It unlocks an exclusive Maya Community Day skin and 5 keys in Borderlands 2. You can check out the source and the other two exclusive skins here. Above the Borderlands 3 logo is a tiny spaceship which, when zoomed into, reveals that there’s three icons surrounding it. The icons are a moon emoji, an equal sign, and a key. The most likely answer here is the simplest: moon = key. The moon is the key to something. But what? Of course, we visited Pandora’s moon, Elpis, back in the Pre-Sequel, and we know that there’s a vault up there. What does this mean? No idea! But I’ll place money on that someone tries to blow up a moon at some point. Edit number three: Reddit user u/CptQ also informed me that there’s more to the spaceship than I previously thought. According to a Reddit comment from user u/BradH420, the ship is actually the ‘New Sanctuary’ and the Collector’s edition comes with a scale model of it. Sanctuary 3 snap model: Construct your very own Sanctuary 3 model ship and display it proudly on its included stand. Fifth: the faces and the writing in the roses. It’s like ‘Guess Who’ but everyone’s red and a rose. If you zoom in on the roses surrounding our dear angelic Psycho, you’ll notice that some of them have faces in them. The faces include our mysterious new vault hunters, Tiny Tina, our new mysterious baddies known as the Calypso Twins, Claptrap, Rhys with that terrible moustache, and several others. However, one of the roses appears to have the word “sirens” embossed upon it. Nothing else. Just that word. What could it mean? Well, there’s currently a theory floating around that the Calypso Twins are both Sirens, but there’s a twist. Historically, there’s never been a male Siren in the history of Borderlands. The theory states that Tyreen Calypso (the lady baddie) can steal the powers of Sirens and give them to others, thus explaining why her brother Troy is all red and glowing and looking like he just left his emo band. This theory could support why Lilith appears to be lacking her awesome Siren tattoos in various shots of the Borderlands 3 trailers. Could the Calypso twins be sucking the powers out of Sirens to further their own, presumably despicable and awesome, cause? That doesn’t really explain why it’s been written on a rose, though. Edit number four: Reddit user u/CptQ also let me know that the rose is most likely a callback to the “6 Sirens” theory that Handsome Jack laid out in Borderlands 2. The theory follows the idea that only 6 Sirens can exist at any given time. Simple enough, let’s move on! Not a poster detail, but a rumour: Handsome Jack is Handsome Rhys now. Handsome Rack? Okay, it’s sort of a poster detail too. You may notice in the photo above that Rhys is certainly looking more… CEO of an evil corporation-esque than he did previously in Tales from the Borderlands. It should be noted that Rhys’ original voice actor, Troy Baker, isn’t returning to voice Rhys, either (thanks GamesRadar for the article!). This is where it gets a bit weird. Randy Pitchford tweeted that “Fortunately, with how Rhys appears in the game, I don’t think [Troy not returning] actually matters at all”. This implies that something has happened to our sweet baby boy between the events of Tales and now, which brings us to my next point – the ending of Tales from the Borderlands. You’ll have to ask Troy. I was told by the audio director that he turned it down. Fortunately, with how Rhys appears in the game, I don’t think it actually matters at all. You’ll see for yourself when the game comes out and you may disagree with me on that or not. If you haven’t played Tales from the Borderlands, just know that the general plot is that Handsome Jack uploads himself inside Rhys’ head using Rhys’ eye implant, and spends most of the game trying to convince Rhys that being a tyrant is good thing and that Rhys should follow in his very handsome footsteps. Towards the end of the game, Rhys rips his own eye implant out (not for the faint of heart) and has the choice to crush it, destroying Handsome Jack forever, or keeping it, sparing Handsome Jack’s soul from whatever level of hell he’s doomed to. Of course, seeing as Tales from the Borderlands is a TellTale game and is all about choices, there doesn’t appear to be a canon option. There’s a chance Borderlands 3 could be taking the “Rhys kept the eye intact” option as canon. Rhys could have not only kept the eye intact, but also uploaded Jack back into his head for whatever reason, although I feel Jack would be wholeheartedly against Rhys’ moustache. This latter theory is supported by the extremely-thin-on-the-ground rumour that Dameon Clarke, the voice of Handsome Jack, is returning to voice some of Rhys’ lines. I’ve yet to find any solid evidence for this outside of people tweeting about it, but Clarke is currently at Kameha Con and it’s possible he could have mentioned something to someone in passing. I’ll update this if I find anything solid. Sixth but also technically seventh: beauty is in the bellybutton of the beholder. I spotted this one myself on my 56th lookover and I’m not too proud of it. The Psycho’s bellybutton has some sort of tattoo or paint-based-graphic around it that seemingly spells ‘COV’. COV presumably stands for Children of the Vault, the faction that’s replaced the in-game bandits. Nothing too presumptuous or outlandish there, then. Eighth? Are we on the eighth? : even more hidden codes! Nekrotofeyo is the Romanic spelling of the Greek word for cemetery. Turns out that our quest for hidden details isn’t over yet! If you edit the poster expertly (read: slap some filters on it) in Photoshop, it turns out that there’s some hidden words above the Borderlands 3 logo. First up is ‘nekrotofeyo’, which is a Romanisation of the word ‘nekrotafeío’, which in turn is the Greek word for cemetery or graveyard, based on how fussy you are. MSPoweruser’s text editor doesn’t support Greek characters, so you’ll just have to take my word for this one. Greek words seem to have a lot of prevalence in Borderlands (Atlas, Hyperion, Pandora, et cetera) so this probably means something big. This code took a little more cracking than the previous one. The second hidden detail was another string of numbers – 22 25 4 20 10 24 21 3 17 19 24 25 4 21. Decoding it using the A1Z26 method gave me a string of letters which spelt ‘v y d t j x u c q s x y d u’, which means nothing. Seeing as Borderlands had obviously used the A1Z26 method before, I knew this couldn’t be a dead end and decided to press on further solely because I’m like that. After a lot of trial and error, I used the Caesar cipher method to 16 places (so A = Q, B = R, et cetera) to further decode our mysterious message and got the following: f i n d t h e m a c h i n e.
Now, Borderlands is pretty rife with machines, so this could be referring to anything. My guess would be that it refers to the machine that the Calypso twins are using for whatever nefarious schemes they have planned. What do you think? Could all of this wild mass guessing actually have some payoff? Or is it just that – wild mass guessing? Let us know in the comments. And let us know if anyone redeems that code! 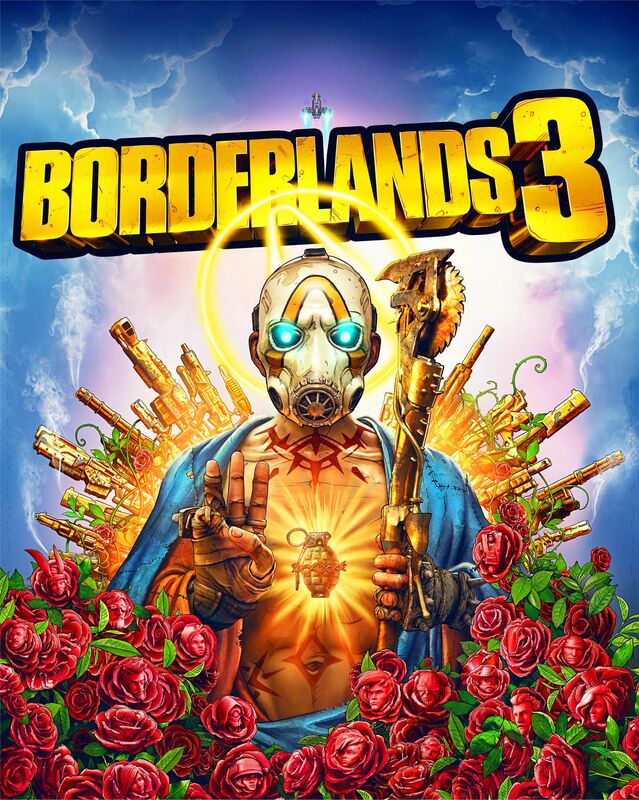 Borderlands 3 is out on September 13th, 2019. We’ll keep you updated if anything fun or unexpected develops.